For those who are still using the trusty old iPhone 3G the recent iOS4 release didn’t really bring much interesting features. Among the list of long-awaited features one in particular wasn’t available on the 3G: multitasking. Another feature that wasn’t available is the Homescreen wallpaper option. Although it was possible to overcome this on the old firmwares using tools like Winterboard. 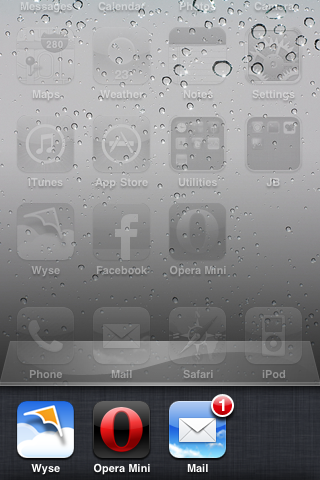 Unfortunately Winterboard hasn’t been released for the new iOS4 just yet. Luckily for us poor saps Apple has only decided to disable these features and not to remove them completely from the iOS4 firmware. Both features can be enabled easily by editing just one .plist file. First you’ll need to Jailbreak your device using PwnageTool4. It’s a self explanatory tool, so there’s no use in guiding you through these steps. Be sure to install OpenSSH using Cydia once the Jailbreak has been executed. Now SCP into your device and transfer the file called N82AP.plist. 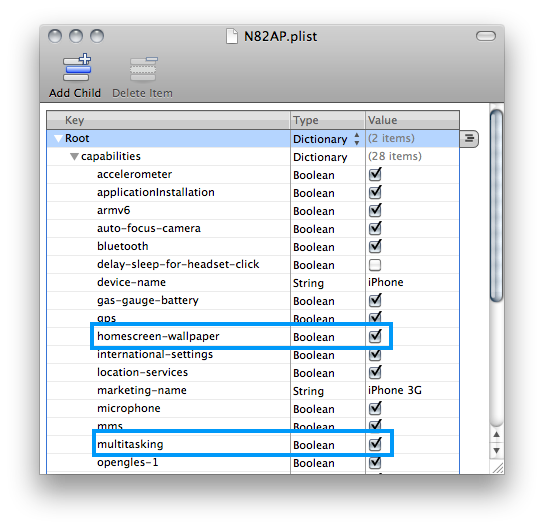 Now use the XCode Property List Editor to edit the plist file. XCode can be obtained freely from the Apple Dev site. Add both “multitasking” and “homescreen-wallpaper” entries as booleans to Root – capabilities. Reboot your iPhone. Both Multitasking and Homescreen wallpaper are now enabled!